Wood Valley Road reopens to traffic. Wood Valley Road, in Pahala is open for traffic. The public is being warned to use caution in this area as flash flooding can occur at any time. Updates will be posted as needed. Please stay safe and keep informed. Mahalo for your patience. Avoid traveling unless it is completely necessary due to roadway conditions and flooding. The National Weather Service reports the Flash Flood Warning is no longer in effect for Hawaii Island. A Flash Flood Watch remains in effect until late tonight. Heavy showers and thunderstorms associated with a slow moving cold front over Hawaii Island could result in flash flooding. Heavy rain could become widespread and cause streams to quickly overflow their banks, leading to life threatening flash flooding. Kukila Street in Hilo remains closed. The Kalapana Lava Viewing Area is closed for tonight. Avoid these areas and use alternate routes. All other roads are open at this time. A flood watch remains in effect through the afternoon for Hawaii Island. The National Weather Service reports a Flash Flood Warning remains in effect for portions of South Hilo and Puna only. A Flash Flood Warning means dangerous flooding is occurring or imminent; and may pose a threat to life and property. Heavy thunder showers are expected to continue through this afternoon for this area. In Hilo, Kamehameha Avenue is closed from Pauahi Street to Ponahawai Street. Also in Hilo, Railroad Avenue is now open, but Kukila Street remains closed. Wood Valley Road remains closed. Be advised to avoid these areas and use alternate routes. All other roads are open at this time. Due to occasional heavy downpours, driving conditions are poor. Be on the alert for additional possible road closures. Due to the thunderstorm, your utilities of power and phones may be interrupted. If lightning threatens your area, the safest place to be is indoors. Should power outages occur, be on the alert for non-operable traffic signals. Please treat flashing traffic lights as a four-way stop. Hawaii Police are reporting that Mamalahoa Highway (Route 11) near Pahala, by the 50 Mile Marker and Kawa are clear at this time for traffic. It appears that the heavy rains have move North. The public is still being asked to drive cautiously since these areas can flare up at anytime and be closed. State Highways signs will remain in place for the next 12 hours. Any further updates will be posted as needed. Thank you for your patience and keeping informed. AVOID Kamehameha Avenue and Pauahi Street intersection, which is impassable due to flooding. The Bayfront Highway is closed. Traffic entering Downtown Hilo from Route 19 must turn right onto Waianuenue Avenue and use alternate routes. The intersection of Pauahi Street and Aupuni Street is closed to traffic. Vehicles are being diverted onto Aupuni Street. The intersection of Kamehameha Avenue and Manono Street/Lihiwai Street is closed. State Highways and County Public Works crews are setting up barricades at these intersections. Do not drive past these barricades. As vehicular traffic is anticipated to increase on alternate routes, including Kilauea Avenue, Kinoole Street, Waianuenue Avenue, Komohana Street, Ponahawai Street, Wainaku Avenue and other lateral streets, motorists are asked to dri ve with caution and exercise patience as visibility is diminished due to heavy rains and roadways may become flooded. 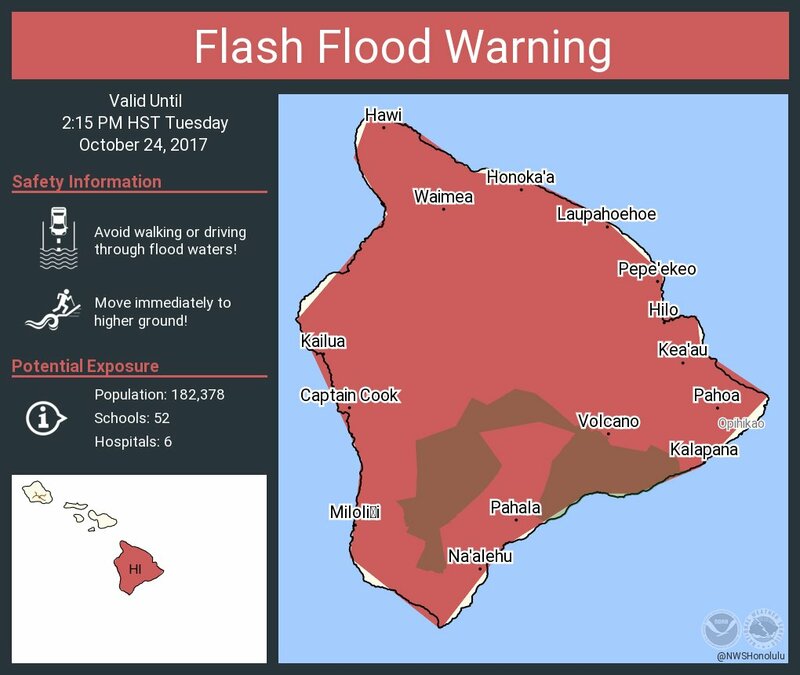 The National Weather Service reports a Flash Flood Warning is now in effect for Hawaii Island until 11:15 a.m. A Flash Flood Warning means dangerous flooding is occurring or imminent; and may pose a threat to life and property. Heavy thunder showers are expected to continue through today. Rain gages along the Kona slopes continue to report rainfall rates of 1 to 2 inches per hour. Radar data continue to show more rainfall approaching the Big Island from the southwest. Kukila Street and Railroad Avenue near Lanikaula Street in Hilo are closed. The Kawa Area on Highway 11 near the 50 mile marker in Ka‘u is flooding. 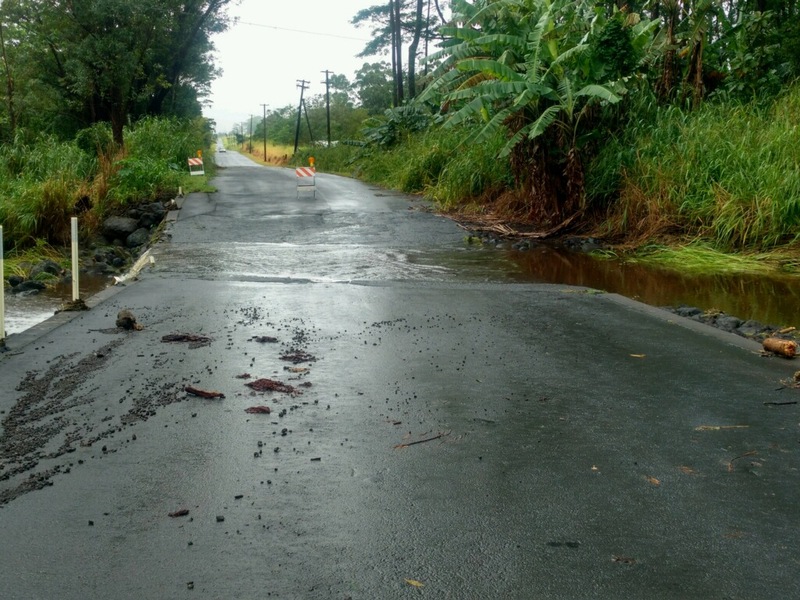 Wood Valley Road in Pahala is closed due to severe flooding. Wood Valley Road, in Pahala is closed until further notice due to severe flooding and hazardous conditions making the roadway impassable. The public is being warned to stay away from this area and to avoid traveling unless it is completely necessary. Updates will be posted as needed. Please stay safe and avoid traveling unless it is completely necessary. Mahalo. Hawaii County Police are reporting that Mamalahoa Highway (Route 11) near Pahala, by the 50 Mile Marker and Kawa are beginning to show signs of flooding. The public is asked to avoid these areas or use alternative routes if they must travel. State Highways is placing caution signs. Please drive with caution is these areas or stay home if travel is not necessary. Updates will be posted as needed. 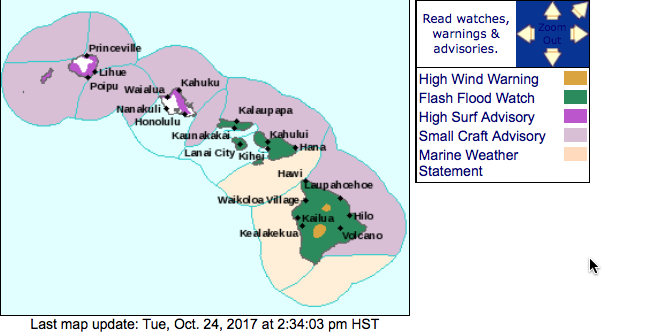 The National Weather Service in Honolulu has extended a flash flood watch for Hawaii Island through this evening Tuesday (Oct 24). At 7:16 a.m., weather radar indicated heavy rain continuing over portions of Hawaii Island. The heaviest rainfall was occurring over the Kona and Kohala slopes from Kealakekua to Hawi, and over the eastern slopes from Pahala to Honomu. Maximum rain rates were in the range of 1 to 2 inches per hour. Rainfall is expected to continue for several more hours. This watch includes the entire island of Hawaii. This advisory may need to be extended beyond 10:30 a.m. if heavy rain persists. Department of Education reports all schools are open. The Kealakehe Police Station in Kona is experiencing intermittent phone disruptions due to inclement weather conditions. If experiencing disruptions in phone service at the station, please call the police non-emergency number at (808) 935-3311. To report a power outage call HELCO at (808) 969-6666. A high wind warning is in effect for Hawaii Island summits until 6 p.m. today (Oct 24). Winds are forecast to be from the southwest at 55-70 mph with gusts over 85 mph being possible. The road to the summit of Mauna Kea is closed at the Visitor Information Station due to strong and gusty winds, heavy fog, wet roadways, and thunderstorm activity.